For the past number of weeks we have been busy exploring everything associated with health in our lives. This has included both food and nutrition and exercise and their importance in our lives and the lives of everyone around us. We first looked at how to keep ourselves healthy. We learned that every person over the age of 5 years old should be exercising for more than an hour each day. We logged some of our activities on a given day and were very surprised at how active we were! Some people even exercised for over two hours on that day. We looked at the role of food and nutrition in our healthy lives and how it is important to consume a balanced diet. We kept a food diary for a week in an effort to highlight all the good foods we eat and how we could change some of the not so good foods we eat. A lot of us have never experimented with food so we undertook a food test. Mr. Geaney gathered some different foods that our taste buds would not be used to and we conducted the test blind folded. We tasted foods like smoked salmon, avocado and chickpeas to name but a few. There were some funny reactions to some of the foods. ​We also looked at the sugar content of foods. We learned that the average daily intake of sugar for a person of our age should be 30g. We measured the sugar content of some of our foods and were very surprised with the amount of sugar in some of our favourite foods. For example a bag of very tasty squashies contain a staggering 100g of sugar for a 160g bag! ​We moved onto looking at the fats that are in our foods. We learned that there are good fats and bad fats – saturated, unsaturated and trans fats. We chose some natural and processed foods and tested them using brown paper. The trace of fat was left on the brown paper. Mayonnaise proved the fattiest of all the foods as can be seen in the pictures below. Some of us will think twice about eating mayonnaise again after that experiment! Because we were looking at healthy foods we also discussed healthier alternatives to some of the foods we eat everyday! We spent an afternoon in the kitchen preparing and baking porridge bread, a healthier alternative to regular bread. The boys were against the girls in the baking contest and it seems that an unanimous victor couldn't be called! We had to make sure that we included enough protein, carbohydrates, unsaturated fats and vitamins in each meal plan for three days. We also created powerpoints and presented these to our class. Mr. Geaney's Daily Mile Officials! For the past 10 weeks we've been hitting the school grounds of Scoil an Linbh Íosa to complete the daily mile challenge. This initiative promotes health and well-being through physical exercise. The aim is to get out for 15 minutes each day and complete a mile. This can be done by running, jogging or walking. As a school we decided to set our sights even higher and see how far we could travel around Europe. Our class was given the big responsibility of collating and calculating the results each and documenting this on our Daily Mile notice board. We've been so impressed with how far each class has travelled and in total the entire school has ran almost 43000 kilometres in 10 weeks! We've really enjoyed our exercise each day and we've seen brilliant increases in our fitness levels. Some of us began our mile journey half walking and running while now each and every one of us is able to run and the mile and often we've done two miles in the 15 minutes. Well done to everyone and keep up the great work! 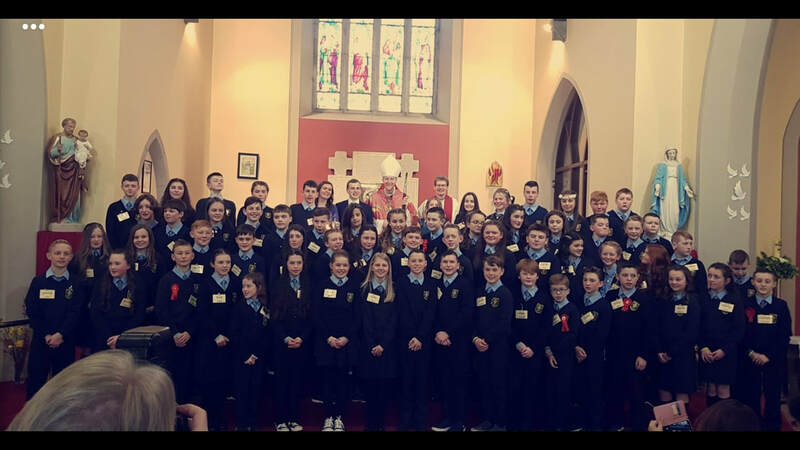 ​On a breezy Thursday in Prosperous, the sixth class children celebrated the sacrament of Confirmation in the company of their families, teachers and friends. From the early morning of the 14th of March, the Church of our Lady and St. Joseph welcomed everyone for this special occasion. The children welcomed their parents, brothers and sisters, grandparents, godparents and sponsors to their Confirmation on Thursday 14th. Many people made journeys from afar to be with the Confirmation candidates, for which they were very grateful. The church was alive with excitement and was bustling with family and friends wishing the best for the sixth class pupils. Much hard work, time and preparation was afforded to this ceremony. The children created many pieces of art work, studied all about the Holy Spirit, it's Fruits and Gifts and it's symbols. The children also explored the best ways they can continue the good work that God has set out for them and how they can do good for the world. The children spent much time preparing prayers, gifts and songs which were all preformed so well at mass. Our ceremony finished with a rousing rendition of 'Spirit-Filled Day' to which a rapturous applause was heard. Many pictures were taken as mementos of this special day. Everyone at Scoil an Linbh Íosa is tremendously proud of our newly confirmed sixth classes. We wish them the very best as they venture through life following the path that God has set for them. The children of sixth class got into the Christmas mood this week by creating a snowman using just socks and rice! The children constructed these lovely ornaments by filling socks with rice and adding coloured materials to top off their creations. We're sure that these pieces of art will be a staple of every house in the years to come. 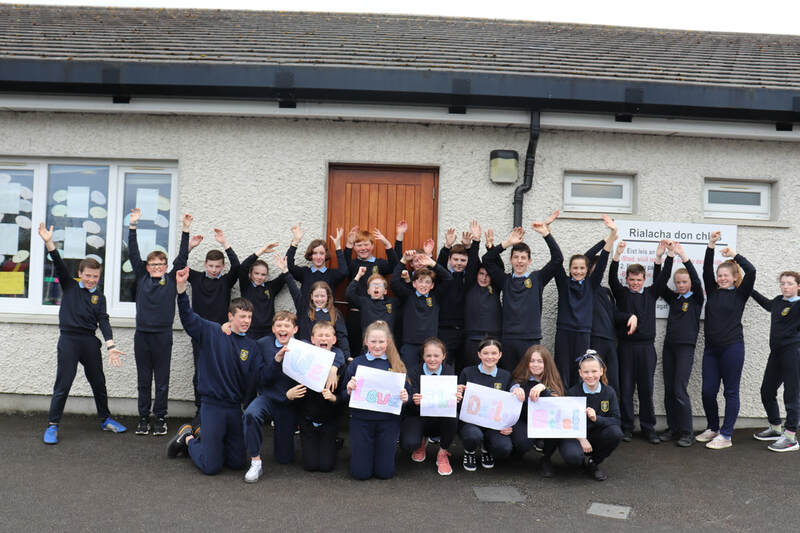 ​To celebrate maths week in school we brought our shared reading partners from Ms. Comerfords senior infants outside to complete a maths trail! We had lots of fun and the senior infants really impressed us with their counting skills! Hopefully we taught them a thing or two! 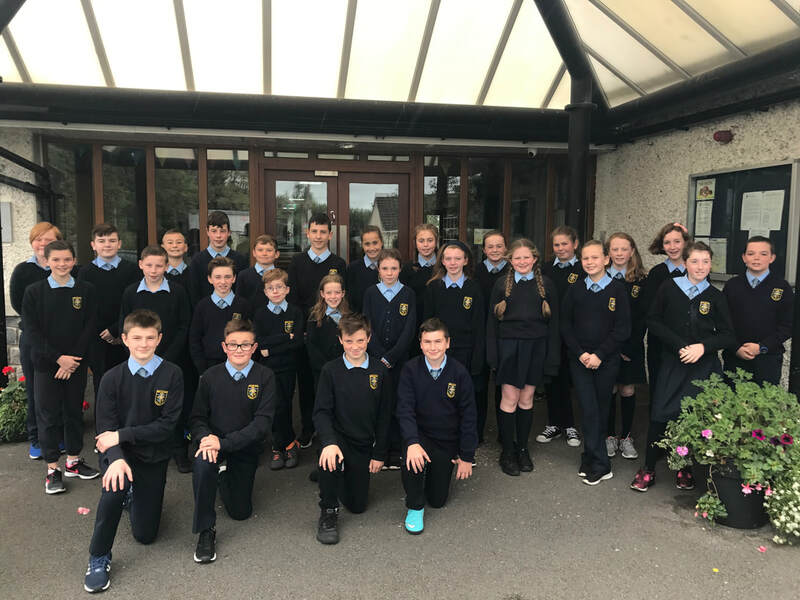 ​Some of the children from our fifth and sixth classes were treated to a STEM workshop on Thursday 11th of October, facilitated by transition years from our neighbouring Secondary School - St. Farnan's Post Primary. Our day kicked off at 10.30 am and we got straight down to business! The children were introduced to their mentoring transition years and were split into groups of four. From this point, the head teacher explained the workshop outline and gave a demonstration of their first task - to build an object that would omit a flashing light when turned. The children worked in groups to complete this task. The second project to be completed was to create a functional rocket that would be able to be launched easily with a design that would let it soar into the sky. The children were tasked with PVC pipes and caps and they had to design fins and launch materials for their rocket. The rockets were then taken outside to an open area where the head teacher and Mr. Geaney launched the rockets using the air compressors. The children watched in amazement. For the month of September one of our main themes has been based on the country of South Africa. We did much research on the country itself, we looked at the animals that are in the Big 5 Safari and we also learned lots of information about the Human Rights activist Nelson Mandela. For drama, we acted out a scene from the Late Late show where our presenter, taking the role of Ryan Tubridy interviewed Nelson Mandela and his family. School has started back and so has the learning and excitement in 5th and 6th class! So far we’ve been settling in, working hard and enjoying ourselves in art, drama and sports. Check in here regularly to see what we get up to this year. We’re particularly excited about our confirmation! Everyone is welcome to our new blog for the academic year of 2018/2019. We hope to keep this blog updated as much as possible with all the happenings in our classroom. We have already got off to a flying start with lots of work being completed. Stay tuned for some special events like the Witch & Wizard walk, School quizzes, science experiments and most importantly, our Confirmation. Enjoy the pictures and videos which are to come!